Shanghai, China (April 29, 2011) /ChinaNewswire.com/ — Hilton Worldwide today announced that during the China Hotel Investment Conference (CHIC) held in Shanghai, Christopher J. Nassetta, president & CEO was honored as "International Hotelier of the Year". The honor was bestowed upon Nassetta for his outstanding contributions to the international hospitality industry. "It is an incredible honor to receive this award", said Nassetta. "I'm very optimistic about the future of our business, particularly here in China, and I’m excited about the prospects of our company to lead the way during this incredible period of growth". 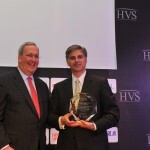 "This prestigious award recognizes truly outstanding industry leadership and I would like thank Chris for his significant contributions to the industry in China and beyond, and congratulate him on this achievement", said Steve Rushmore, president & founder of HVS, which organizes the CHIC conference and manages the award nominations through the CHIC Advisory Board. The CHIC Awards recognize industry leaders, rising talent and hotels setting high benchmarks. They acknowledge outstanding hotel developments, best practices, industry talent and contributions to the growth of the industry in China. HVS is the world's leading consulting and services organization focused on the hotel, restaurant, shared ownership, gaming, and leisure industries. With the successful experience in organizing China Hotel Investment Summits 2005 to 2009, HVS launched the revised edition of China Hotel Investment Conference (CHIC) in 2010. Hilton Worldwide is the leading global hospitality company, spanning the lodging sector from luxurious full-service hotels and resorts to extended-stay suites and mid-priced hotels. For 92 years, Hilton Worldwide has been offering business and leisure travelers the finest in accommodations, service, amenities and value. The company is dedicated to continuing its tradition of providing exceptional guest experiences across its global brands. Its brands are comprised of more than 3,700 hotels and 610,000 rooms in 82 countries and include Waldorf Astoria Hotels & Resorts, Conrad Hotels & Resorts, Hilton Hotels & Resorts, DoubleTree by Hilton, Embassy Suites Hotels, Hilton Garden Inn, Hampton Hotels, Homewood Suites by Hilton, Home2 Suites by Hilton and Hilton Grand Vacations. The company also manages the world-class guest reward program Hilton HHonors®. For more information about the company, visit www.hiltonworldwide.com. Christopher Nassetta joined Hilton Worldwide as President and Chief Executive Officer in December 2007. Previously he was President and Chief Executive Officer of Host Hotels & Resorts, Inc. a position he held since 2000. He joined Host in 1995 as Executive Vice President and was elected Chief Operating Officer in 1997. Before joining Host, Mr. Nassetta co-founded Bailey Capital Corporation in 1991, where he was responsible for the operations of the real estate investment and advisory firm. Prior to founding Bailey Capital Corporation, he spent seven years at The Oliver Carr Company, ultimately serving as chief development officer. In this role, he was responsible for all development and related activities for one of the largest commercial real estate companies in the mid-Atlantic region. • CoStar Group, Inc. – an independent director for the nation's leading provider of electronic commercial real estate information. • The Real Estate Roundtable (RER) – member and immediate past Chairman for the organization which brings together leaders of the nation's top public and privately-held real estate ownership, development, lending and management firms with the leaders of major national real estate trade associations to jointly address key national policy issues relating to real estate and the overall economy. • Federal City Council – member of the non-profit, non-partisan organization dedicated to the improvement of the Nation’s Capital. • Arlington Free Clinic – has served in various positions for the non-profit, community based, volunteer driven organization which is committed to providing access to quality health care services to low-income, uninsured county residents. • Wolf Trap Foundation for the Performing Arts – director for the organization which presents and creates excellent and innovative performing arts programs for the enrichment, education and enjoyment of diverse audiences and participants. • McIntire School of Commerce Advisory Board member for the University of Virginia. • The John F. Kennedy Center for the Performing Arts – Vice Chairman of the Corporate Fund which ensures that our national cultural center is the nexus of the performing arts for dance, music and theater. Mr. Nassetta graduated from the University of Virginia McIntire, School of Commerce with a degree in finance. He resides in Virginia with his wife and six children.